Safely heat flammable liquids in steel drums. Quality silicone rubber and fiberglass construction is moisture-proof for durable long life. Simple spring and hook fastener for easy installation and removal. Thermostat assembly has 10' cord with NEMA 5 – 15 plug. High limit cut-off limits band temperature to 80% of "T" rating, the auto-ignition temperature of the flammable product, as referred to in National Electrical Code Article 501. Specify "T" rating when ordering (T3 or T4A). Operates on 120 volts AC. 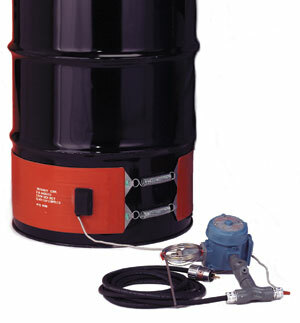 Hazardous heaters are also available in 240V and for 30 gallon steel drums.